Valentine’s Day: a great excuse to eat too much, write mushy cards, have chocolate for breakfast, and slow dance in your living room. I’m ALL on board. We started early, on Saturday night. The Husband made not one but TWO Italian feasts: spaghetti and meatballs and chicken parmesan. (His mother’s recipe, coming soon.) YUM. Cupcakes for dessert. Yesterday morning began with cinnamon rolls, and ended with filet mignon with Stilton cream sauce and creamy mashed potatoes. 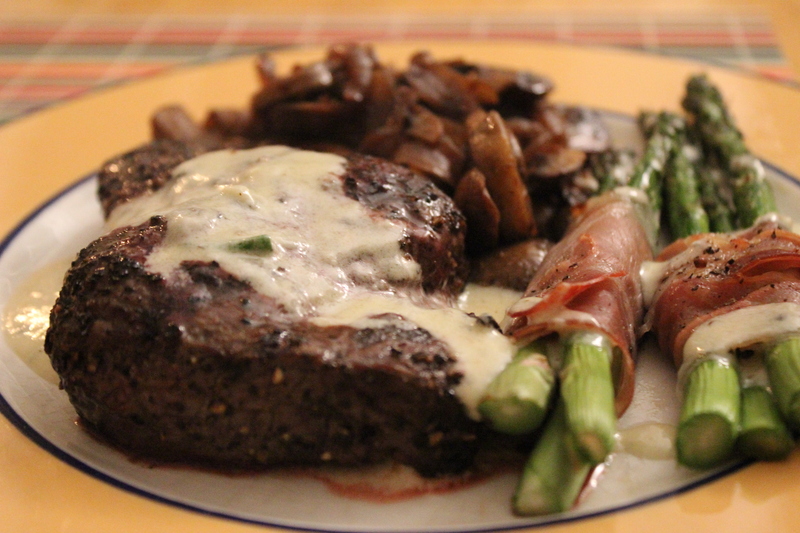 (Turns out he made me the same meal for Vday last year, all details listed here.) Chocolate mousse heart for dessert, pictured above. Obviously, we had a side heaping of ice cream. I challenge someone out there to tell me they ate more decadently than we did. Hope you all had a fabulous Valentine’s Day! I was a “vegetarian” for about ten years (i.e., I focused only on consuming pasta and cheese, and found that adopting the mantle of “vegetarian” was helpful in my quest to avoid all foods that were not pasta and cheese). Burgers put an end to that. The year was 2002, the setting, a 4th of July BBQ at a high school friend’s house. Two (vegetarian) friends and I, bowled over by the smell of the grill, steathily helped ourselves to a burger. We made our way to the garage so no one could see us, and carefully passed the stolen burger between the three of us, sharing bites, until it was gone. Incidentally, so was my vegetarianism. 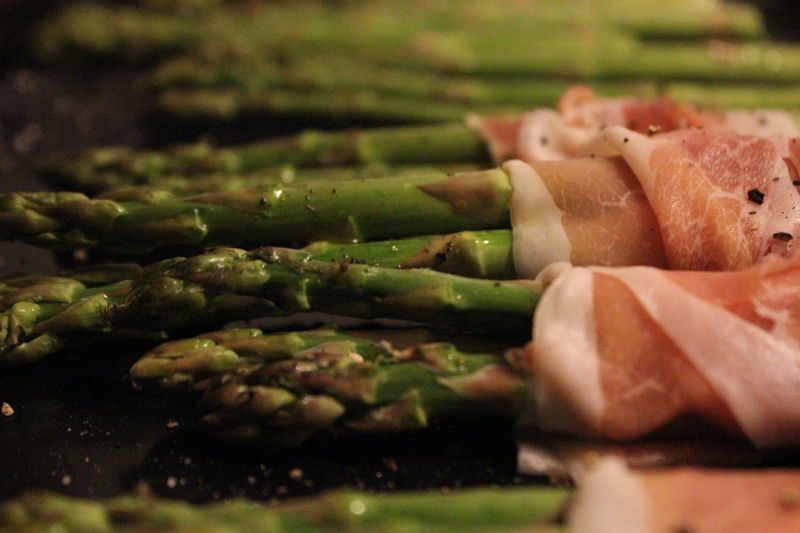 Thirteen years later, I actually love vegetables and eat far more than pasta and cheese. (Side note: YAY!) And at least once a summer, I get that BBQ smell wafting under my nose and I just know: tonight is burger night. Thanks to Husband for always indulging me. In a large bowl, mix your meat, Worcestershire, spices, onion and garlic together. Form four large patties (don’t overwork the meat). Note – the fattiness from the sausage and the ground beef will help to bind the patty together. If not, add an egg and some breadcrumbs to help your cause! Heat a grill pan over medium-high heat and spray with cooking spray. Add your patties – cooking two at a time, or so – and cook about four minutes per side. I like to tent the pan with aluminum foil in order to help the middle cook through a bit. Prep your buns! 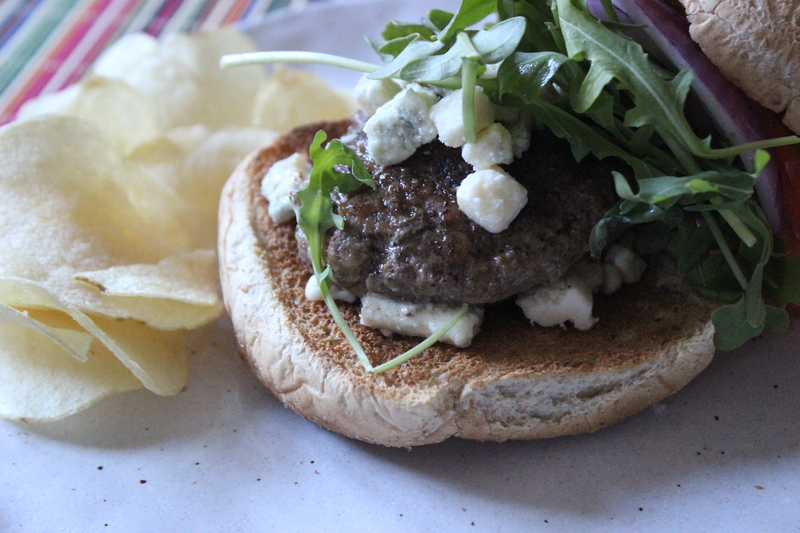 Add Gorgonzola to the bottom of each bun – this will help it melt. (You can also add to the top of the burger as it cooks, either way.) Add the meat patty and your favorite toppings. Obviously, don’t forget the chips. I love Valentine’s Day. Love, love, love it. It is all of my favorite things, combined in one beautiful day. Chocolate, cards (ok, I know people like to get down on Hallmark holidays, but honestly, who doesn’t looooove browsing the Paper Source?! ), flowers, food, and of course, my husband. Despite the fact that we are technically newlyweds, this Saturday marked our ninth February 14th together. And it was the best one yet, planned entirely by him, & capped off by this ridiculous meal, also prepared by him (with a little help from Ina). Preheat the oven to 400 degrees; heat a large oven proof skillet over high heat. Pat dry the filets with paper towels. Brush a little bit of oil over them and season with salt and pepper on both sides. Start making your sauce by pouring the cream into a small saucepan. Bring to a boil over medium-high heat and then simmer for 20 minutes, stirring occasionally, until the cream is reduced by half. Add the steaks to the hot pan and sear evenly on all sides, about 2 minutes per side. Top each steak with a pat of butter and place the pan in the oven. Cook for about 10 minutes. Remove, cover tightly with foil and allow to rest. Remove the cream from the heat,a dd the cheese and stir until melted. Season with salt and pepper, add scallions or chives. 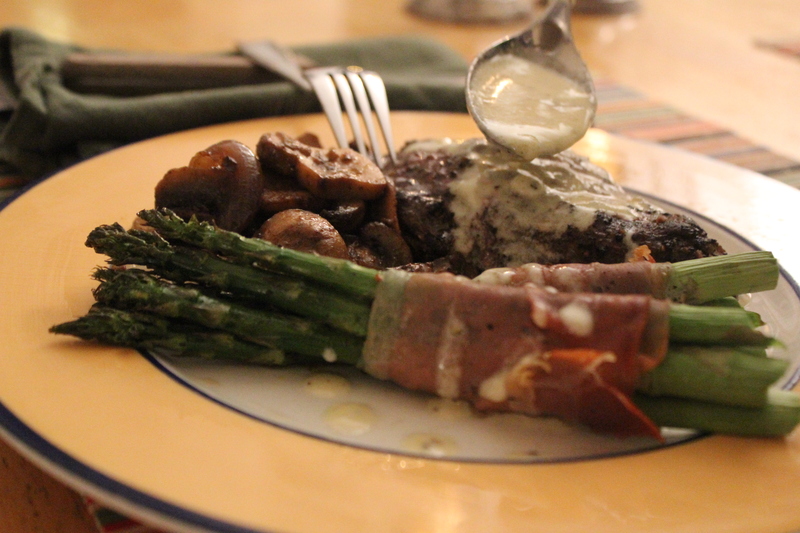 Serve steaks topped with the sauce…and if you’re lucky, like I was, with a side of sauteed mushrooms, prosciutto-wrapped asparagus, and a good bottle of red wine.